As a video editor for the first half of his career, Gary Pearce always paid a lot of attention to audio – so much that Perry Cheatham & Tom Guild tapped him to work at SoundTrax in 2002 after he left a full-time video job. Like all the SoundTrax production staff, “audio engineer” doesn’t quite cover it. Gary’s done a lot of writing and a little VO announcing. So during a recording session, Gary can work with voice talent – professional announcers or your company CEO – and help them get their best performance. And he can suggest a few tweaks that add clarity to a script. But it’s all low-key, and you always have the last word. Once the recording’s done, Gary can edit and mix, add music and effects, all the usual stuff, with just the right pacing and rhythm to keep your listener’s focus. Or he can break the pieces apart and send them on to your video editor (or just to you) so you know what you’ve got. He’ll deliver to your specs, or help you figure out what you really need. Gary’s been putting these pieces together since he got his ham radio license in 1965, and majored in Radio/TV Communications at Loyola of Chicago. Gary then worked for several boutique video production companies, and one small TV network (NBC). He was first hired to do audio, but video editing was the sweet spot, and he learned it quickly as that industry was just getting started. He cut plenty of audiotape with a razor blade back in the day, but he embraced digital technology once it reached the professional level and never looked back. Gary moved to Raleigh in 1990, got married there in 1998, and North Carolina has been home longer than Chicago was. He keeps busy by combining his roots – that ham radio thing – with the latest media outlet: podcasting. 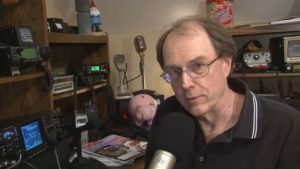 His HamRadioNow.tv show is both a creative outlet and a way to keep current. In the ham world, Gary is KN4AQ.